Searching for the name of a ‘cousin’! I know she is a relative, but I don’t know her name. This photo was in my grandmother’s photo album. I know she is related, but I don’t know her name! My grandmother was Mary Veronica Neville who married Francis Patrick McTygue. I know that both of my grandparents had only Irish ancestry. So my first clue is that she is part Irish. 1. The photo was taken in Oshkosh Wisconsin. 2. I know that my grandmother had a relative that lived in Wisconsin – James Kehoe married Mary Neville in 1876 in Green Bay. 3. I know that James and Mary had three children: Joseph born 1877, James born & died 1882, and Mary Ellen born 1885 – she married William Patrick Corrigan in 1906. 4. 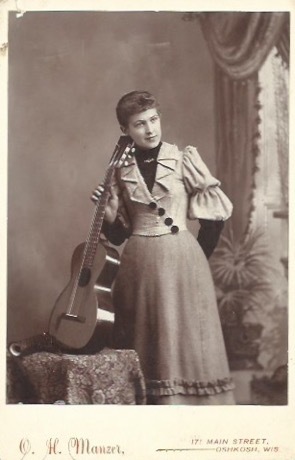 The photo is a “Cabinet Card” from the 1870’s – 1900. I am going to try to find out the name of my Irish ‘cousin’!